I guess I am lucky in one sense…I never used sugar in coffee…I don’t drink soft drink or juices and I don’t really have a sweet tooth. BUT I am s huge food carboholic eg potatoes, pasta etc! That was the first thing I said when told I was diabetic…don’t you DARE take my potatoes away from me…I am after all Scandinavian…we LOVE outlet potatoes! Maybe that is why I got so pissed off when I found out I had diabetes! My husband is a sugar addicts with a BIG A….he has been diagnosed as insulin resistant years ago but won’t stop! Lollies, cakes, ice cream, highly processed foods like pies, sausage rolls etc are on his menu EVERY day! Even when he sees me filling in diaries…torturing my poor finger tips 15 times a day…half starving myself some days still to see 15 in glucose monitor…injecting twice a day…he won’t or maybe the word is CAN’T stop! I am born with the hereditary diabetes gene and also the “Familiar HyperLipids” (FH) gene so I have the double whammy…he doesn’t apparently! If you know what Trigs are…they are allowed to be max 2…mine are 42 and I can eat celery sticks for the rest of my life and still have HIGH Trigs and Cholesterol! I am currently on a new trial (a medication not available to the public yet)…only 1000 Aussies with FH are participating in. Instead of taking cholesterol statins every day…I do an injection every 2 weeks and actually it is due today (and stings like hell!!! )back to m hubby so he is not born with the hereditary gene which FALSELY makes him think he is “safe”! So here I am…some days half starving myself to keep BSL down (afternoons are the worst for me…BSL ALWAYS seems to be high even though I haven’t eaten ANYTHING since 8.30am…….just for him to walk in the door and start stuffing his face and he doesn’t stop until he goes to bed! He doesn’t eat breakfast…hardly ever lunch BUT from about 4pm it is CONSTANT EATING…he doesn’t drink alcohol! He can’t understand why he feels yuck in the stomach and is exhausted all the time and sure as hell won’t listen to me! He won’t allow me to take his BSL….scardy cat cuz he KNOWS it will be through the roof! He has headaches EVERY DAY…no bloody wonder when his body is bombarded with all that garbage from 4pm to about 9.30pm! He is a ticking time bomb with belly fat and about 30 kg overweight! His Dad has type 2 too but never checks his sugar cuz he doesn’t want to know what it is! I wonder if they ACTUALLY understand what diabetes is doing to their organs? My kidneys are already down to about 50% capacity and I get hypercalcemia (which can quickly become fatal and almost was 6 months ago with a calcium level of 3.78 and it becomes fatal at about 4)! Dr only ever tested glucose and never insulin which actually is more important! My glucose was always fine BUT when they tested my insulin…all hell broke lose! I was told from the beginning I am not allowed to get diabetic meals in hospitals or/and on planes etc…I MUST have my carbs which confused me until one day I was admitted…they had me on diabetic diet…I took my insulin as normal but wasn’t eating the same foods as at home and CRASHED BIG TIME VERY QUICKLY after my almost NO carb lunch with a BSL of 3.1….holy crap I felt HORRIBLE! I NEVER want to feel that low again! They were stuffing me with crackers, cheese, tomato sandwich YUCK…apple juice BUT forgot the GOLDEN RULE…fast release carbs must be given FIRST…eg jelly beans, skittles, juices etc…slower release AFTER so it took longer for my BSL to go up! NOBODY has taught me how to count carbs…I just eat the same thing EVERY day because if I deviate just a little bit especially at dinner…my BSL go all whacked and I have to set my alarm during the night to test BSL cuz it WILL go do quickly at some point and often about 8-9 hrs after taking insulin (Humalog 75/25, 48/48 units). The rapid acting insulin doesn’t work on me and I don’t understand why! It doesn’t control carbs I will have on my breakfast and dinner…it does nothing! My BSL will start going down when the 4-5 hrs are gone where the rapid actually works…very strange! I think cutting out everything we crave for is dumb. Sooner or later we have to cheat and feel guilty for a day. I have learned to have a treat once in a while and not feel guilty. We eat out a lot. Before we go I look up the menu and the carbs listed. ( Most restaurants do that now). And plan ahead what to order. Yes being on a pump lets us cheat now and then. I think this all gets a bit easier if I have a cookie .. I have cut out few things, but i have increased my food choices. More choice is a wonderful thing, even if some of those things were not choices pre D.
My biggest problem is though…what REALLY triggers high BGL…is of course potatoes and the “high” lasts a long time 🙁 I had my usual dinner last night but for some reason had that horrible “starving” sensation so I added an extra potato to the mix. BGL was 10 when I started eating at 6.30pm…I took my 49 units of Humalog immediately before eating as supposed to do the rapid acting insulin can work at the right time…..BUT….at 12.15am BGL was STILL 14! I can’t take NovoRapid at that time due to the risk of “stacking” of insulin…so I waited…and waited! Dozed off to wake up on the lounge at 1.45am and BGL was 11.4 and I thought…bugger this…going to bloody bed! Woke up at 5.45am…checked BGL and it was 7.7…more or less dropping by 1 every hour! It is catch 22! I am NOT allowed to stop eating carbs…YAY but without receiving ANY education as to count them, control them and understand them…it is a bit difficult! My carb intake NEVER consists of sugar, ice cream, lollies, cake, donuts etc…I don’t eat stuff like that…it is just not my thing BUT I can live purely off potatoes, pasta, rice etc! I know they are more or less just as bad as eating highly processed sugar stuff except they do have just a bit of nutritional value because I eat the skins of the potatoes and now that I think of it…I actually haven’t had pasta or rice since I was diagnosed 6 months ago….potatoes is my BIGGEST weakness! I HAVE TO HAVE my potatoes but it sets of my BGL like crazy 🙁 I tried the 25% less carb potatoes…they are REALLY nice but bloody expensive! I have another weakness…Jatz Clix and they are probably equivalent to eating 10 teaspoons of sugar but I loooove them! I have never been a big meat eater! I am Danish…we LOVE our pork and chicken…hate lamb and like beef/veal/venison/duck/goose/pheasant and tolerate fish but for me it MUST be salmon…not a white fish eater! But mostly….potatoes are almost a part of every dinner meal unless you cook a pasta or rice dish…which is not all that often! I can see where I am headed and I am just not ready for a pump yet! I think all other options should be tried before taking on the pump! But by George I would love to eat a hashbrown of just a porato WITHOUT FEELING GUILTY…and knowing all hell will break lose in 2-3 hrs time with Libre beeping like crazy (actually had 2 Libre free days but felt “naked” somehow) and Freestyle Optimum arrow will flash at me saying….NAUGHTY NAUGHTY ? There’s so many different things said about food & the ‘right’ diet with diabetes. 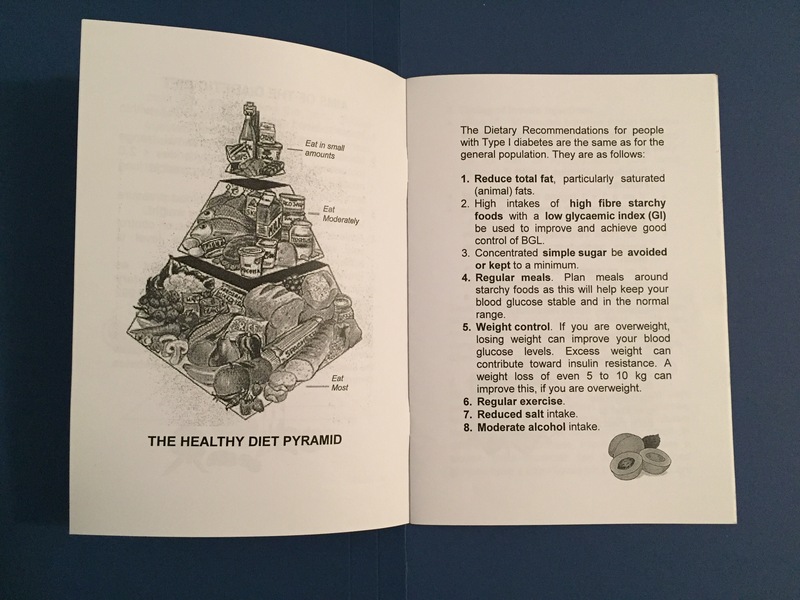 My endo very much believes in a low carb diet, and I firmly believe I will never have a low carb diet because as you said – we have to eat to avoid going low. So I basically just spend my whole day snacking to regulate my BGLs, and will just eat a consistent amount of carbs over the whole day. I dont like to eat a lot of carbs at once but if I go out then I’m not going to worry about it & I’m just going to enjoy myself.